This page provides a more detailed description of how to configure the SAM C21 Sigma-Delta ADC peripheral. After reviewing the basic module functionality, we describe the key configuration steps (and associated registers) that need to be configured to implement a simple application where the SAM C21 digitizes a light sensor signal. The Sigma-Delta Analog-to-Digital Converter (SDADC) converts an analog voltage to a signed 16-bit value by integrating and decimating the output of a sigma-delta modulator. The filtering and decimation are done using a SINC-based filter that has zeroes placed to minimize the aliasing effects of the decimation. This is a third order SINC filter (see the figure below) with an adjustable Oversampling Ratio (OSR) to achieve higher throughput versus signal-to-noise-ratio (SNR). For example, an OSR of 64 provides a an output data rate of 23 ksps while an OSR of 1024 produces an output data rate of 1.4 ksps. Why is the decimation filter input 2 bits wide? The SAM C21 Sigma-Delta ADC module is differential, so the output may be positive or negative. Because of this, the bitstream out of the Sigma-Delta modulator is actually 2 bits per sample, because a sign bit is needed. The SDADC provides a signed result in a 24-bit register to allow for gain and offset correction without overflow in hardware. Because the result is in 2’s complement format, the SDADC result is signed 16-bit (maximum) using ±VREF. Using the internal VREF set at 1.024 V, the SDADC will produce codes to 1.024 V. The internal VREF can be configured to supply a reference of 1.024 V, 2.048 V, and 4.096 V.
The range selected in the REFSEL register must match the supplied VREF and must be set independently of the internal VREF. The Sigma Delta Analog-to-Digital Converter (SDADC) can be used for high-resolution DC measurements. These measurements can include temperature sensors, thermocouples, cold-junction compensation, 3-4 Wire RTD sensors, 4-20 mA current loops, current (Shunt), as well as scales/load cells. The Sigma-Delta architecture provides a low-cost solution for these precision measurements, requiring only a simple R-C low pass filter for anti-aliasing. A generic clock (GCLK_SDADC) is used to generate the CLK_SDADC via a 7-bit prescaler. The GCLK must be configured and enabled before the SDADC can be used. The sampling clock is derived from the CLK_SDADC/4. Therefore, the maximum CLK_SDADC is 6 MHz and the maximum sampling frequency is 1.5 MHz. The GCLK_SDADC is asynchronous to the APB bus clock and, therefore, writes to registers require synchronization. This flexible clocking system allows configuring CLK_SDADC to run in any Sleep Mode. The 7-bit prescaler enables flexible sampling frequency adjustment. The SDADC supports differential measurements on three analog input channels. The measurements are done using one of four references; internal bandgap, an external voltage on AREFB, DAC output, or AVCC. The voltage reference has a selectable buffer to offers higher input impedance to the external reference. 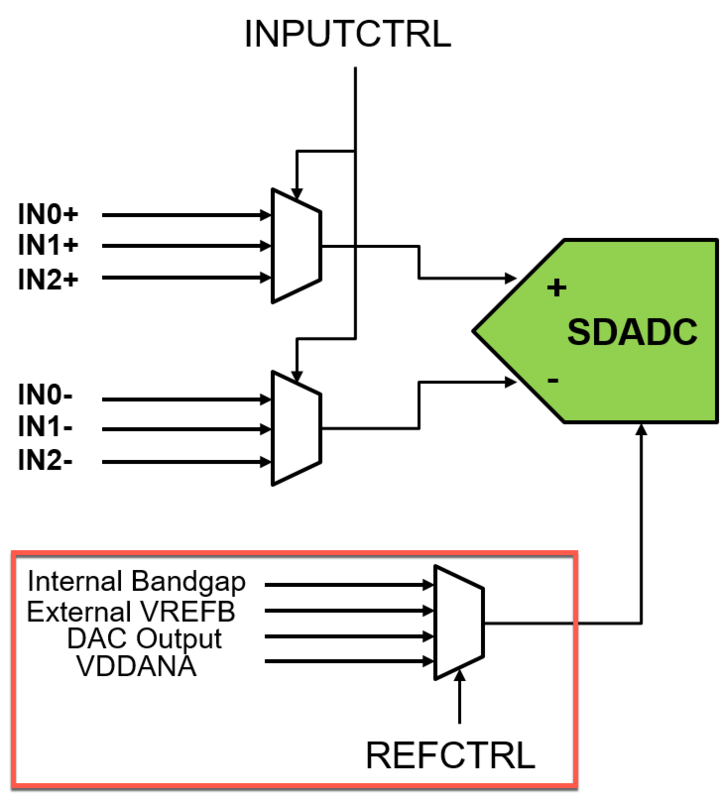 The SDADC filters and decimates the sigma-delta output bit stream at 16-bit (signed) with programmable rates of CLK_SDADC_FS (prescaled ADADC clock frequency) divided by 64 to 1024. The Output rate is set by modifying the programmable Over Sampling Ratio (OSR). The result is a 2’s complement 24-bit result with programmable gain and offset correction. 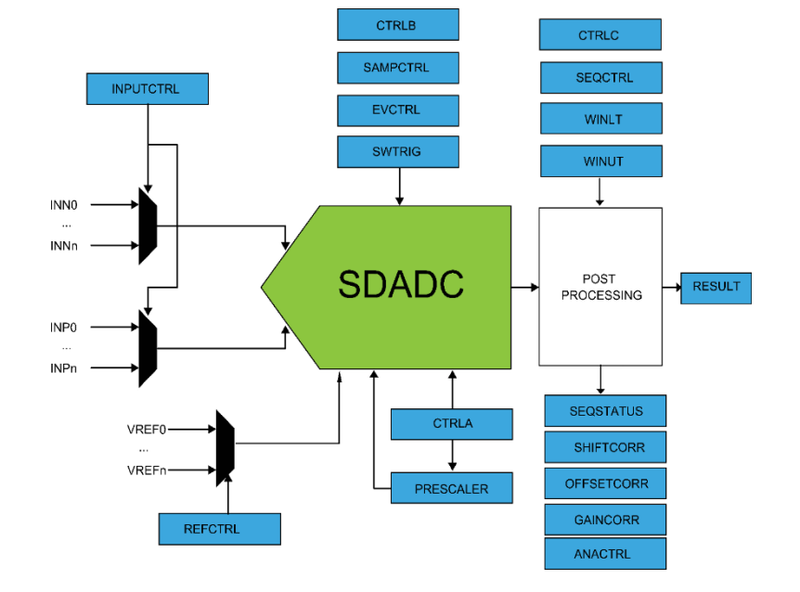 The SDADC peripheral supports three interrupts. The result ready flag (INTFLAG.RESRDY) can trigger a DMA transfer or event. The window monitor can generate an event by setting the EVCTRL.WINMONEO] bit. The INTFLAG.OVERRUN flag is set when the previous result is not read before a new result is ready. Automatic sequences can be configured to enable multiple samples from a single start of conversion request. The order of this conversion is from the lower positive input pair to the upper positive input pair (AINN0, AINP0, AINN1, AINP1 …). If SEQCTRL register has no bits set to '1', the conversion is done with the selected INPUTCTRL input (MUXSEL). The window monitor can be used to define a threshold and trigger the WINMON flag (or interrupt). The SDADC result ready flag (INTFLAG.RESRDY) is set when a conversion is complete. When the peripheral is first initialized, the results are only valid after the third conversion. To automate this limitation in hardware, the register set includes the skip register (CTRLB.SKPCNT[3:0]) to automatically skip the first n results. When in free running mode, the application must read the result before the next result is ready. If this does not happen, the overrun flag (INTFLAG.OVERRUN) will be set. The result is read from RESULT and is 24-bits wide. To get the 12- to 16-bit conversion result based on the OSR, the application needs to shift the results. However, this can be accomplished in hardware using the SHFTCORR register to define a number of right shifts to be done automatically. Also, a fixed gain can be applied in the same way. Care must be taken to set the gain to at least 1 if not used as it is automatically applied. The PWM circuit is not required in this application; it is merely an artifact of the development boards used in this example. We will drive pin PB13 low to provide a ground reference to the ADC(-) input. To see the full project details, visit the SAM C21 Sigma-Delta ADC Example Project page. The default oscillator source clock is the internal OSC48M 48 MHz oscillator, which is divided by 12 to provide a 4 MHz clock source on reset. GCLK_1 is used to source the asynchronous clocks for the SDADC peripheral channel (Channel 35). The conversion is performed on a full range between 0 V and the reference voltage. Analog inputs between these voltages convert to values based on a linear conversion. REFCTRL.REFSEL[1:0] selects the source for the reference. For this example, the light sensor output voltage covers the full range from VDD to GND, so we want to set VREF to VDDANA (3.3 V). REFCTRL.REFRANGE[1:0] needs to be set based on the voltage level used for the reference. The required setting is the 2.4 V - 3.6 V value, since VDDANA is 3.3 V.
There are three differential inputs available to the SDADC, so we need to select which pair is connected to the module via the INPUTCTRL register. Now the SDADC module can be easily triggered to sample and convert the input voltage. To do this, first you need to clear the INTFLAG.RESRDY flag. Then you set the SWTRIG.START bit to trigger the conversion. Then wait for the INTFLAG.RESRDY bit to be set, indicating that the result is ready. Finally, read the SDADC result from the RESULT register into a variable. Recall in this example, we configured the SDADC module to automatically shift the raw 24-bit result into a 16-bit result, so we do not need to perform any shifting in our application.